Communities, businesses, governments and individuals are coming together to raise awareness about the importance of recycling during the first Global Recycling Day on March 18. For Keefe Harrison, CEO of The Recycling Partnership, every day is recycling day. The Recycling Partnership works to improve recycling across the United States by helping communities add recycling carts, develop infrastructure for recycling and educate residents on the do’s and don’ts of recycling. In the past three years, The Recycling Partnership has placed 407,000 carts and supported 583 communities nationwide, resulting in 115 million pounds of recyclables diverted from landfills. 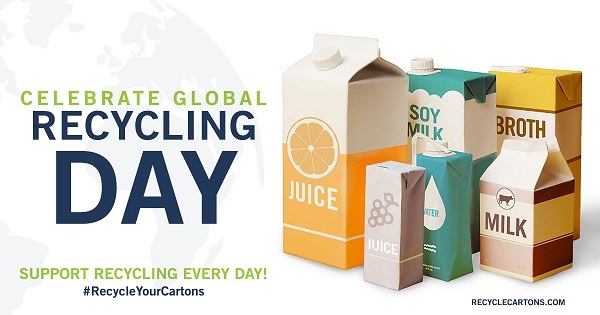 A recent education campaign in three major cities resulted in a 12 percent increase in the number of cartons placed in recycling containers, much of it due to raising awareness that cartons and other recyclables should not be put in plastic bags first. Since Keefe joined The Recycling Partnership four years ago, the organization has grown significantly, from one staff person to 18. It now enjoys the support of hundreds of community partners and nearly 40 funding partners who are “in the bin together,’’ including Coca-Cola, Target and the Carton Council of North America. In recognition of Global Recycling Day, the Partnership is continuing its efforts to boost the number of Americans who recycle, which currently stands at 50 percent. It also is loaning out a technical expert to a group in Indonesia for three weeks to help with a project to reduce marine debris. The Recycling Partnership estimates that if every U.S. family recycled properly, the recycling rate would double and 22 million more tons of recyclables would be captured each year. That would save 50 million metric tons of greenhouse gas annually, the equivalent of removing 10.5 million cars off the road every year. Global Recycling Day is petitioning world leaders to take action to preserve the planet through recycling. To sign the petition and learn more about Global Recycling Day, to go globalrecyclingday.com.